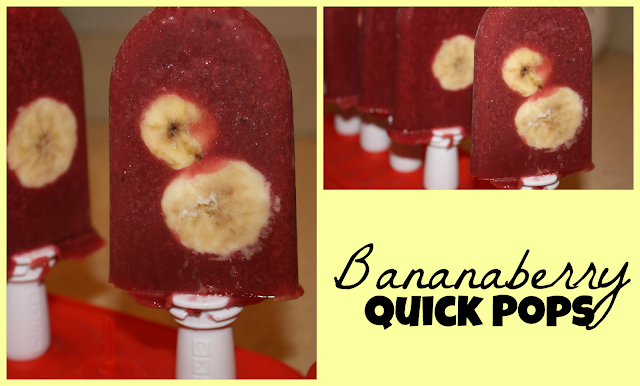 Skinny Jeans: Bananaberry Quick Pops! I recently told you about the Kiwi Cherry popsicles I made with my new Zoku Quick Pop Maker. The popsicles were a big hit with my family, so it was time to try out a new kind - bananaberry! This kind is my husband's favorite so far! I got more popsicle sticks and a storage case that holds up to 6 popsicles. Now I'm ready to go to town! I found this recipe in my Zoku Quick Pops Recipe Book. Combine the berries and 1/2 of the banana in a blender and puree until smooth. Using a fine mesh sieve, strain the mixture into a medium bowl (using a spoon to scrape the sieve so it goes through faster.) You get the berry mixture without all the seeds. You should have about 2/3 cup (5 1/2 oz) of the strained mixture. I may have had a little more. Stir in the apple juice and agave nectar. Slice the remaining 1/2 banana into 1/8 inch thick slices. I used a knife to apply the banana slices to the walls of the pop maker molds. Putting the bananas too close to the bottom of the maker will cause part of the popsicle to not come out. Insert sticks and pour pop base until you reach the fill line. Let freeze completely. Repeat with the remaining pops. Yields 6. If don't have a Zoku maker, you could always try them in a regular popsicle mold. Carolyn - thank you so much! I'm so excited to hear that!